As we get older the production of hyaluronic acid and collagen decreases, causing an increase in the appearance of facial folds and fine lines. However, you do not have to live with unsightly wrinkles. At Allure Aesthetics located in Great Falls, MT we offer dermal fillers as a safe and effective alternative to treating facial fine lines and wrinkles, without the additional cost and downtime associated with surgery. During the process of normal aging, lines and wrinkles form and facial volume associated with youthfulness begins to dissipate. 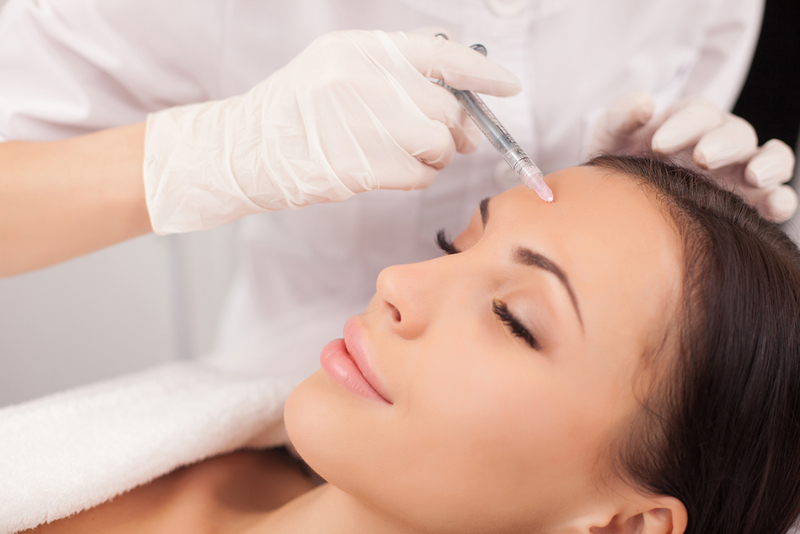 At Allure Aesthetics, we use two types of fillers: (1) Juviderm, which is a hyaluronic acid – a naturally occurring substance in your skin that gives skin volume and hydration it is a gel of smooth consistency. And (2) Radiesse, a volumizing filler immediately provides the volume and lift needed to diminish the signs of aging because of the calcium-based microspheres and gel that comprise the product. What’s unique about RADIESSE Volumizing Filler is that it acts as a scaffold under the skin, providing structure and stimulating your own natural collagen to grow. This process continues for several months, which extends the initial effect of RADIESSE Volumizing Filler. Best of all, the natural results are clinically proven to last a year or more in many patients. Lip augmentation with fillers is one of the most popular procedures today. Dermal fillers can be injected into the lips and the areas around the lips to enhance the shape or size of lips. Volume loss of the lips occurs naturally with time, and replacing this volume can result in more youthful looking lips. Fillers can be used for cheek augmentation to correct age-related volume deficit in the mid-face or to give the appearance of a high cheek bone. Cheek augmentation helps fill out sunken cheeks and improve facial contour, giving a more youthful appearance to the face. Juvederm is an injectable filler with a smooth gel like consistency. It is formulated from Hyaluronic acid, which is a naturally occurring substance found within the human body to aide in water retention and volume. When injected into the skin, Juvederm can safely and effectively restore facial contours and improve the signs of aging by diminishing the appearance of facial fine lines and wrinkles. In addition, Juvederm may also be utilized in lip augmentation to create more plumped, fuller lips and target sunken areas of the face, such as the cheeks, to create a more volumized appearance by adding volume to the facial tissue. Furthermore, Juvederm is effective in stimulating the production of collagen, allowing the skin to experience continued improvements. Which areas can Juvederm Treat in Great Falls? Radiesse is an injectable filler utilized for the treatment of facial wrinkles and folds, generally located around the mouth and nose. Radiesse works by adding volume to the skin and ‘plumping up’ wrinkled or folded areas, such as filling in laugh lines. In addition, Radiesse stimulates the production of the body’s natural collagen. The results reveal a smoother, more youthful appearance. The ideal candidates for Radiesse are adults between the ages of 35 and 60 who are unhappy with the wrinkles or folds that have developed around the mouth and nose area. It is recommended for patients to receive retreatment, generally, every two years, in order to maintain optimum results. What is After Care like? There is no downtime associated with dermal fillers, allowing patients to return to their daily activities immediately after treatment. However, it is recommended for patients to avoid strenuous activities and excessive sunlight exposure for at least 24 hours post-treatment, or until the redness or swelling has subsided. Patients are advised to refrain from consuming blood thinning medications, such as Aspirin, Ibuprofen, Advil, Motrin, etc. a few days before the procedure, as these substances could cause excessive bleeding or bruising post-treatment. Alcohol and smoking are also discouraged during the weeks leading up to treatment. Dermal fillers are not recommended for individuals who present with a bleeding disorder or active skin infection. Those are pregnant or breastfeeding are encouraged to post-pone treatment. It is important to note, individuals with a history of herpes may experience an outbreak. During the consultation, we will review your medical history and let you know if you are a candidate for dermal fillers. What are the benefits of Dermal Fillers in Great Falls? If you would like to learn more about Dermal Fillers, then call or stop by Allure Aesthetics located in Great Falls, MT today! Dermal fillers provide a safe and effective alternative to treating facial fine lines and wrinkles, without the associated risk or downtime of surgery. Book your consultation today and say goodbye to facial wrinkles and folds!